As we pull on winter coats and wool hats to shield our tropical bodies from the cold, there is a creature in our midst that survives Alaska's coldest temperatures bare-naked. The red flat bark beetle lives as far north as there are balsam poplar trees in Alaska, hunkering down for the winter in the moist area between dead bark and tree. Scientists like Todd Sformo, from the University of Alaska's Institute of Arctic Biology, find most of them in the larval stage, where they resemble segmented worms a bit longer than a grain of rice. He finds a smaller number of adults that have handsome segmented bodies the color of teak. 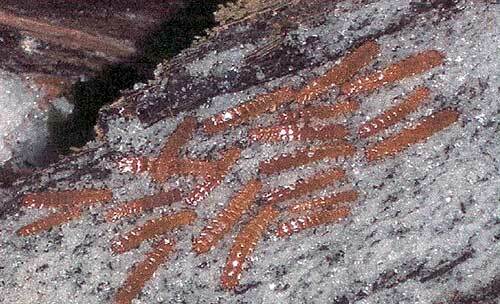 Larvae of the red flat bark beetle hibernating on ice. Photo by Jack Duman, University of Notre Dame. The beetles are special among living things in Alaska because they have the ability to spend the winter above the snow, exposed to the coldest air of winter. Sformo, a graduate student working in Professor Brian Barnes' lab, has cooled the beetles to minus 94 degrees Fahrenheit (minus 70 degrees Celsius) in the lab, and they have not died. Yellowjackets, stinkbugs, and other insects that survive winter using the same strategy, known as supercooling, perish at about minus 13 degrees Fahrenheit (minus 25 degrees Celsius). "They really have to be under that leaf litter and under the snow (for insulation from the cold air)," Sformo said. How cold can the bark beetles get? Sformo shipped a few of the beetles to a lab in California to find out. The owner of the lab lowered the beetles to a temperature of about 238 degrees below zero (minus 150 degrees Celsius), and they didn't freeze. The lowest temperature recorded on Earth was minus 129 degrees Fahrenheit recorded in Antarctica in 1983. Alaska's all-time low is minus 80 degrees Fahrenheit at Prospect Creek, off the Dalton Highway in 1971. "Under the right conditions, these things don't freeze, even when you get down to unearthly temperatures," Sformo said. 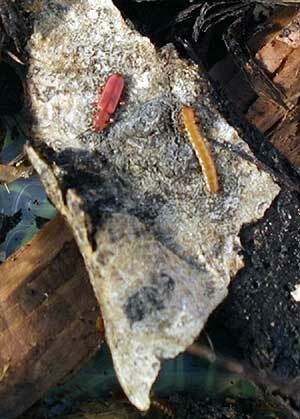 The adult and larva versions of the red flat bark beetle, one of the hardiest organisms in Alaska. The beetles survive by being one of the most successful northern practitioners of supercooling, where they are able to resist freezing by combining a few unique talents. Beginning in August, they begin to produce antifreeze proteins that bind to sites where ice might form. Later in the fall, they produce glycerol that drives their freezing point down as antifreeze does in a car, and, finally, they begin to lose water in their bodies. Sformo and colleagues at the University of Notre Dame also have studied another Alaska beetle that's nearly as good in the cold as the flat bark beetle. The larger beetle Upis ceramboides, which has no common name, survives the winter in dry crevices in trees. Unlike the flat bark beetle, the Upis beetle tolerates freezing rather than avoiding it. Sformo found that the Upis beetles froze at about 18.5 degrees Fahrenheit (minus 7.5 degrees Celsius) in the lab and survived temperatures down to about 104 degrees below zero (minus 76 degrees Celsius). "Using opposite strategies, we have two beetles that can survive to the minus 70s (Celsius)," he said. The Upis beetles have the ability to force water outside their cells, where it freezes without puncturing cell membranes. They seek out dry places to spend the winter, which makes the contrasting choice of the red flat bark beetles to crawl under moist bark seem remarkable, Sformo said. The bodies of red flat beetles often are stuck to ice, the best substance known to trigger freezing. "These insects, in winter, are in direct contact with ice crystals, for months," he said. "You can't get a better nucleator than that." The proteins created by the red flat bark beetle fascinate scientists because they are ingredients of an all-natural antifreeze liquid, a version of which might someday be used to cool human organs to preserve them. Other applications that might be teased from the secrets of Alaska's beetles are a non-toxic de-icing solution for aircraft, a concrete that builders can pour in the cold, or an ingredient that would prevent the re-crystallization of ice cream, which makes large crystals form inside an open pint.